Manipulative to the point of shamelessness, My Life remains one of the most effective mainstream tearjerkers of the past two decades, in part because—for all of its mawkish flourishes—its premise and heartrending power remain universal. Shot with a straightforward blandness that reflects its bluntness, Bruce Joel Rubin’s film concerns detached Los Angeles PR exec Bob Jones (Michael Keaton), who’s dying of kidney cancer that’s now spread to his lungs, and which hasn’t been stymied by various medical treatments. This is anguishing enough to Bob and wife, Gail (Nicole Kidman). Compounding matters is that Gail is pregnant, and Bob fears that he won’t survive long enough to see the birth of his child—a dilemma that compels him (in an act that presages today’s smartphone-recording culture) to begin incessantly videotaping messages to his unborn offspring in an effort to communicate with the kid in the future, once he’s gone. 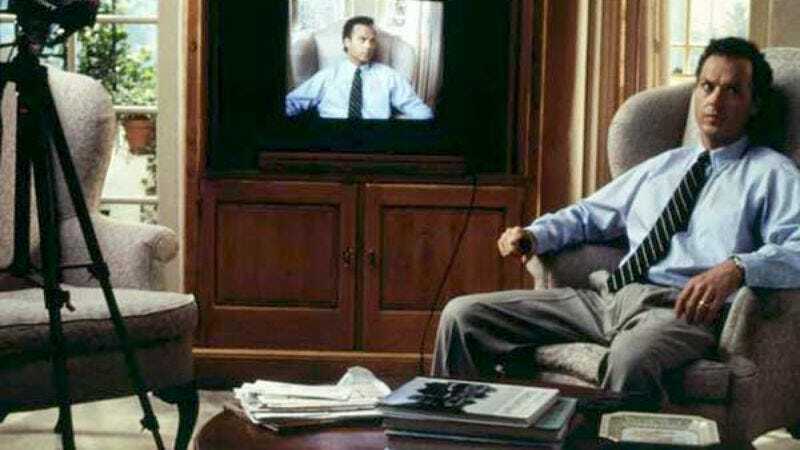 Those VHS dispatches are the maudlin lifeblood of My Life, and far more effective at wringing tears from viewers than subplots involving Bob’s visits to a Chinese healer (Haing S. Ngor) and his efforts to reconcile with his estranged Detroit family. The film is concerned with Bob’s reconciliation with his past and confrontation of his failings, all of which culminates with a Fellini-esque surprise that helps heal one of Bob’s decades-old primal wounds. Still, more than those threads, it’s the portrait of the bond shared by Bob and Gail during this unbearably trying ordeal that really elicits the uncontrollable waterworks. A great, nuanced Keaton and an understated Kidman fully and compellingly commit themselves to characters whose thoughts and feelings—about each other, themselves, and the future they can no longer share together—vacillate wildly between hope and despair. Treating their all-too-common scenario with respect for the arduous emotional toll such fatal diseases take on everyone involved, My Life pulls at the heartstrings with abandon, but in a manner that stays true to the pain of death, and the means by which everyone tries to find some way to live on through those left behind. Availability: My Life is available on Blu-ray and DVD through Amazon or possibly your local video store/library. It can also be rented or purchased through the major digital services.